Gordon became friends with Bill Scott through correspondence, finally meeting up with him on his trip to Australia in April 2003. Timberhead Music is proud to offer the American edition of this Australian treasure, compiled by Penny Davies and Roger Ilott. Bill has written many wonderful songs about his homeland, a few of which Gordon has had the pleasure to record. 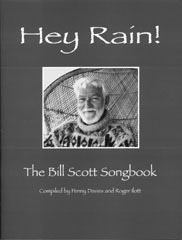 This collection of songs, photos and notes, first published in Australia in 2002, is full of the heart and humor of a very special man. 56 pages.